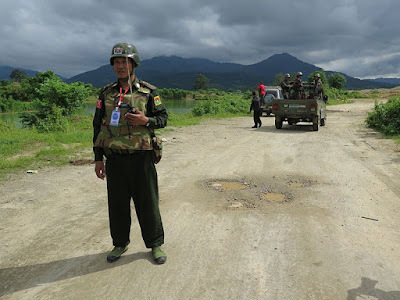 Myanmar's military has used heavy weapons to overrun remote rebel camps in northern Kachin state, the army said Friday, as a seasonal offensive ramps up the long-running conflict. A separate military campaign in Rakhine state, which has forced 655,000 Rohingya Muslims over the border into Bangladesh, has dominated global attention. But the conflict in Kachin, a mainly Christian state in the Buddhist-majority country, has rumbled on away from international headlines and fighting is again intensifying now that monsoon rains have ended. The army -- or Tatmadaw -- said it had gained the upper hand after seizing 22 camps of the Kachin Independence Army (KIA) since mid-November and blocking off a key timber smuggling route to China. Heavy weapons were used Thursday to attack hillside camps as the army killed "some enemies" and seized arms and ammunition, according to a statement posted on Facebook by the office of commander-in-chief Min Aung Hlaing. "Tatmadaw columns are in hot pursuit of fleeing terrorist insurgents," the statement added. The rebels and the army trade allegations of abuses, while observers accuse both sides of trafficking timber, jade and drugs to fund the fighting. After a 17-year ceasefire, the KIA restarted its fight for autonomy in 2011 resulting in unrest that has killed hundreds and displaced more than 100,000 people. The KIA confirmed the renewed hostilities were "very serious" and that the military was using airstrikes and heavy artillery against its positions. "Our ethnic groups didn't launch the offensive. It was the military. We are only fighting back," KIA spokesman Lieutenant Colonel Naw Buu told AFP, also denying rebel involvement in the illegal timber trade. "That timber is not from Kachin state. We have no trees left to cut down," he said. Like many restive border areas in the country, access for journalists, diplomats and aid groups is heavily restricted, making independent verification of claims on either side difficult. Aung San Suu Kyi's civilian government swept to power in the 2015 elections, but Myanmar's military retains control of the key defence, border and home affairs ministries. That effectively gives it a carte blanche to conduct operations without parliamentary approval. Suu Kyi's government is desperate to reach a binding peace agreement with some two dozen armed ethnic groups. But fighting across Kachin and Shan states is threatening talks. "If the fighting goes on, it could upset all the peace plans," political analyst Khin Zaw Win told AFP. "The tragedy for Myanmar is these two processes are going on in tandem. There doesn't seem to be any coordination and the military is upstaging everything." Hundreds of people have been displaced across Kachin and neighbouring Shan, the UN said, confirming reports that army mortar shells on Christmas Eve landed near a camp sheltering some 6,900 people. "Yet again we see men, women, and children fleeing violence for the second or even third time," UN spokesman Pierre Peron said.